Any artist whose had enough practice will usually agree that the materials they use do make a difference. Balancing quality and cost can be tricky though. Whenever I shop for my own supplies, I try to weigh the quality of the materials against the expense as well as my own limitations. For instance, I might like to use a very expensive Sennelier pastel, but the $5 a stick price tag often makes me re-think the purchase. Yes, it's true that the Sennelier pastel is probably the best, but I also have to consider my own artistic limitations and whether I want to spend that much while I'm still learning to use the media. 1. Is this the best quality I can afford? 2. Does it make sense given my own artistic limitations? If it's not helping me be more expressive or producing better work is it worth it? 3. Will I use it? I have seen artists create brilliant works of art with nothing more than a #2 pencil and others fall short using the best money can buy. However, if the materials are an extension of your abilities and you can afford them, buy the best you can because cheap is rarely quality and quality is rarely cheap. That said, here is my one exception to the rules above; I occasionally buy something different or more expensive if it's on sale because I want to try them out. 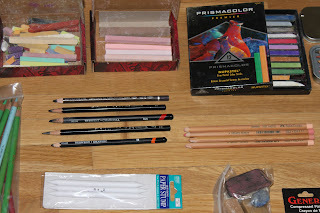 Essentially I know that I might not use a box of iridescent pastels right away, but someday I'll want to give it a try. 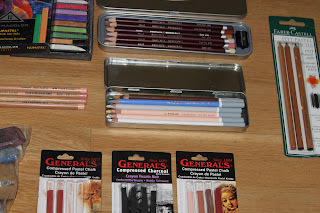 General makes an inexpensive Conte like compressed pastel that I like to use for sketching. It's much less than the actual Conte brand and in my experience just slightly lower in quality. Also in this category is Prismacolor Nupastels. Type: Graphite Drawing - Derwent Graphic (England), Caran d'Ache Grafwood (Swiss). 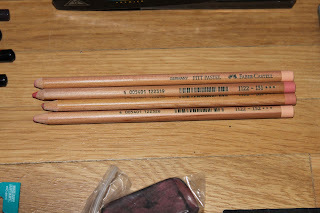 Each of these serves a different purpose, but they are all very solid pencils and worth every penny in my experience. 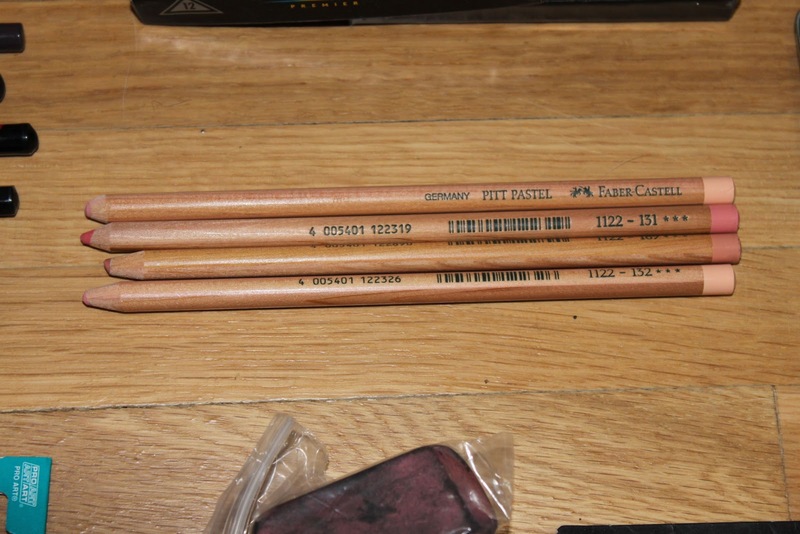 I also use the higher quality Faber-Castel PITT pencils which are also quite excellent. 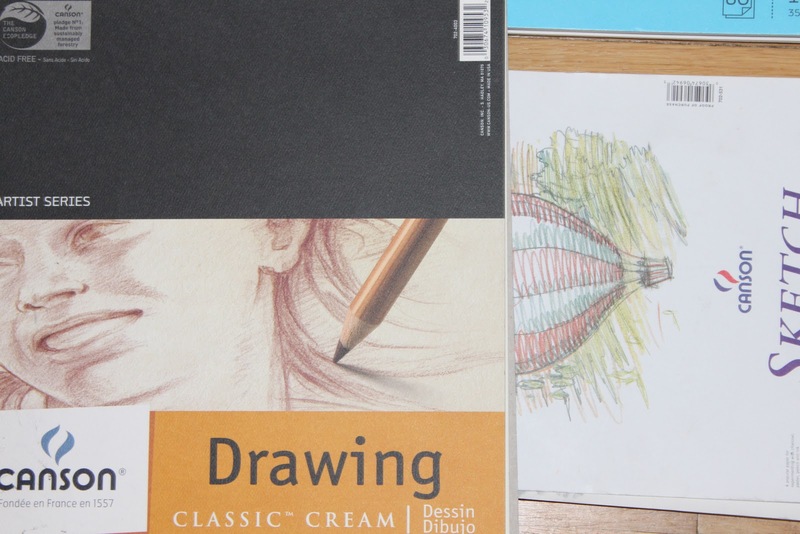 Since I mentioned Faber-Castel I should say that they probably make the very best pastel pencil I've ever used. 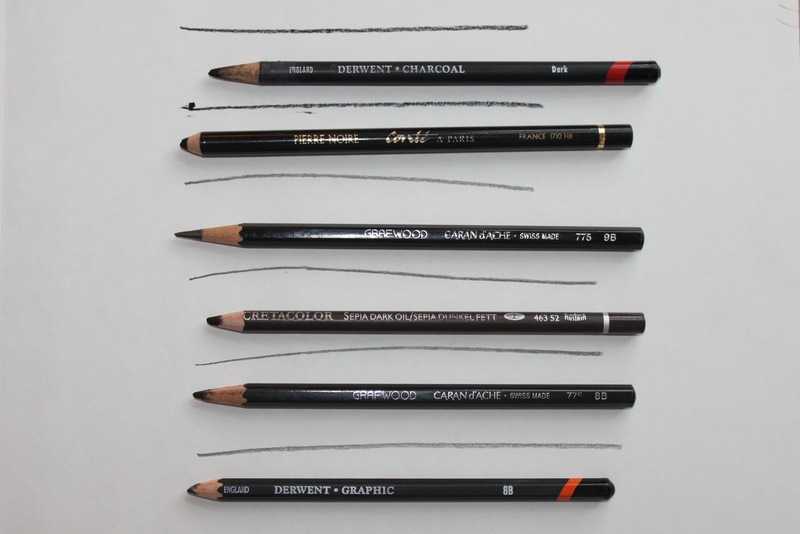 The ones to buy are PITT PASTEL, which are also made in an oil pencil. Both are outstanding. The PITT Pastel by Faber are smooth and not too chalky. The pigments are strong and that translates into vibrant colors. My experiences have been mostly limited to portraiture so I'm not sure about their landscape or other colors, but would expect them to be good as well. 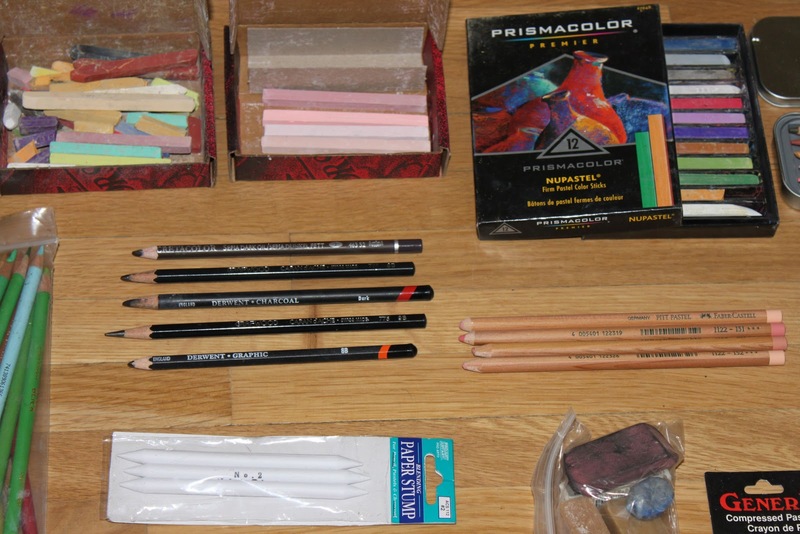 I also have a number of pastel pencils that you can also use wet. You can add water to get various effects. The Nupastels by Prismacolor work wet as do the Derwent colorsoft pencils. I haven't tried the Stablio Carbothello's but I understand they may also work wet. Believe it or not the best erasers I use are the Paper Mate Pink Pearl eraser. They work great for most of the work I do and they're inexpensive. 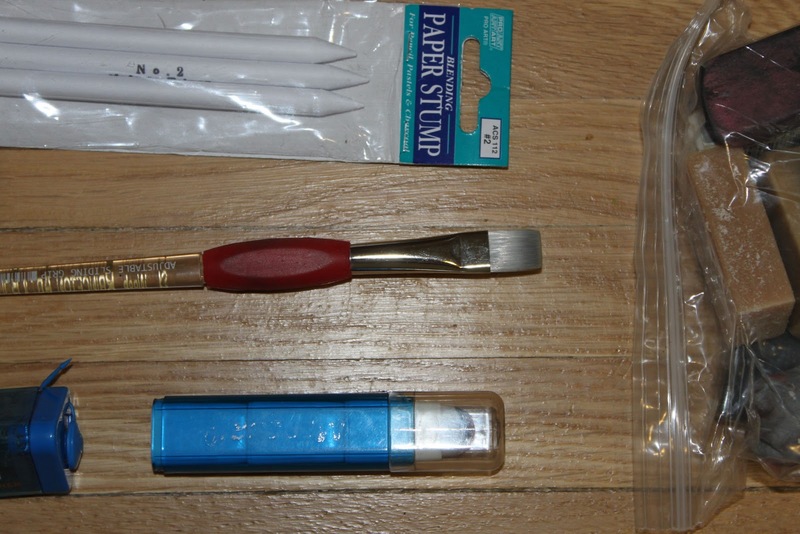 I also use gum erasers, kneadable erasers (very handy for charcoal) and the blue and white eraser which helps me with sharper edges. I also use paper stumps and shapers for pastels. For larger charcoal drawings I use vine charcoal for the outlines than chunky charcoal for the rest. I also use drafters tape to tape off some of my drawings which gives them a nice clean border after the tape is removed. I also use a variety of colored pencils. 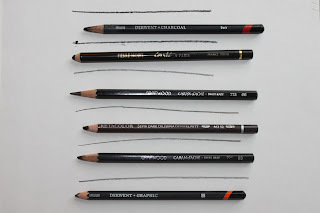 For years I used only Prismacolor pencils, but either their quality fell or other pencils just got better so that now I find more often than not I am using Caran D'Ache or even standard Blick colored pencils. They all work well. Also, get yourself a good blender as they can really make the difference on a colored pencil drawing. When it comes to drawing it's all about the paper. If you want your drawings to look good and last long then investing in good paper is a wise idea. I've spent as much as $30 on single piece of 20"x30" Italian Magnani, 100% rag, 140 lb paper. It was expensive, but well worth it. For my less ambitious projects I turn to sketch pads, both large and small. I use the Canson Mix Media paper for pastel, pencil, charcoal and ink especially. It holds up well and accepts the media with ease. For purely pastel drawings I like to use the Strathmore Grayscale paper. I also use a more expensive Bristol paper which accepts just about anything and is very nice paper. It has a nice tooth and comes in a variety of great colors. Which brings me to my next point. Don't be afraid to use colored paper because it's fun to see what it can do for a drawing...escape the white. No matter what you decide for paper make sure it's ACID FREE. If it's not acid free you might as well toss it away when you're done because it won't last. If you're like me and you tend to save everything, there's nothing more disappointing than looking at a drawing you did five years ago and the paper has turned an ugly yellow. 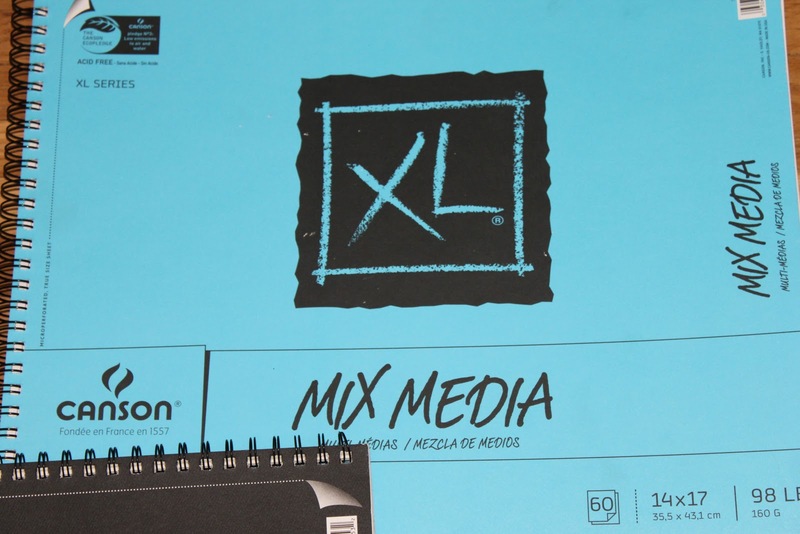 If you like to sketch it's a good idea to get yourself some decent 8.5 x 11 paper. I use all kinds, as long as it's acid free, but Canson is my favorite these days and it won't cost you a fortune. Finally, I know people who swear by a good drawing table and I have no doubt it works for them, but I don't own one. 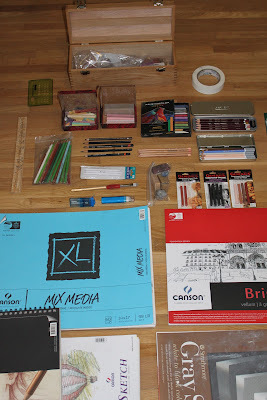 I use my kitchen table, a large drawing board or just the pad itself. I'm not too picky about the surface I use under the pad because I can find myself outside and again I just rely on the pad. Since I also oil paint there are good reasons for me to use better materials in my drawings. If my drawings come out better it usually translates into better paintings. If I can match the colors in a study sketch it really helps when it comes to finally painting a subject. Good luck with your art and please leave a comment if you have any suggestions or questions. Labels: Art Supplies, How to.